At Quadwave, employee happiness is not just a mantra or concept. It’s a way of life. No wonder we take The Happiness Pyramid pretty seriously. 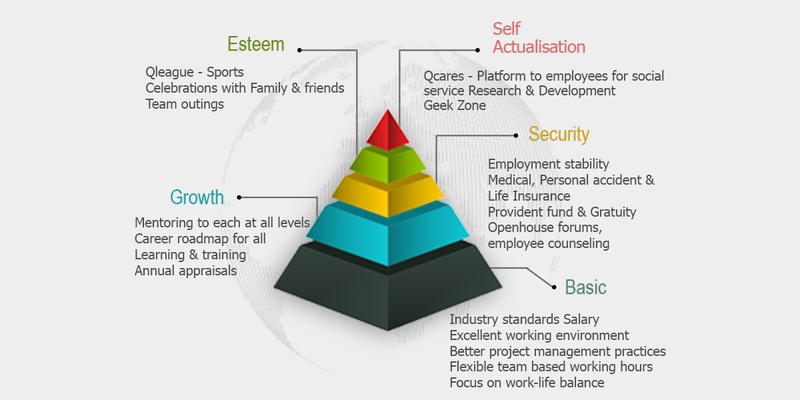 The Happiness Pyramid is based on Maslow’s Hierarchy of Needs but the management at Quadwave has built upon it and turned it into something that is real and relevant for the employees. The reason for using Maslow’s model is simple. It gives a peek into basic needs of an individual while at the same time zooming out to give a view of their self-esteem etc. Quadwave’s version of the different levels of Happiness in its employee’s life includes needs that are both the professional and personal. At the bottom of the pyramid are the basic needs of an employee which includes providing an improved quality of life, a salary that meets industry standards, and good working conditions. Better project management and planning helps people spend quality time at home. Monitored and controlled annual appraisals see to the positive growth of the employee within the organization. Providing equal opportunities to rise and shine is one of the primary goals here. Whether it is project managers, architects, software engineers, trainees, the boys who run office errands or even the sweet man who brings coffee for all of us here, effort is taken to ensure that there is complete growth. Monitoring and managing appraisal driven targets, goals, trainings, etc. goes a long way in making this happen. Opportunities are provided for internal as well as external trainings which helps in grooming and mentoring our employees at all levels. For overall growth in personality, there are regular soft skills and communication workshops. Growth is directly linked to certifications and contributions. Security in an office environment is not limited to job security only. One of the ways in which Quadwave takes care of this need is by offering employee counselling and holding open house forums where employees are encouraged to ask questions to the CEO. Also, knowing that the company has you covered in case of any medical emergencies (up to 3 lakhs) is a relief in more ways than one. Peace of mind is invaluable and this is what we provide, through insurance coverage that includes term life insurance of 7 times the annual CTC, maternity benefits, health check-ups etc. The motto at Quadwave is that hard work should lead to a good amount of play. Employees are encouraged to have fun even at work, and there are actual events such as QLeague which are held annually where cricket, carrom and TT matches are held between in house teams. It all culminates in the Annual Day celebrations on 16th July when friends and family are invited to a bash where employees are celebrated. Annual appreciation letters are sent out to the parents of employees in recognition of their contribution to Quadwave. Team lunches and outings help in bonding, while month end parties are where the whole office comes together every month for an evening filled with fun, music and food. Movie nights are organized on public demand and the pantry is made into a place where the employees can rewind, relax, play games, read books, etc. The need for self-actualisation runs through us like an undercurrent, and Quadwave recognises this need and lets it take shape. Peace of mind and contentment are not mere catchphrases that are bandied about here at Quadwave. Thanks to QCares, an initiative by Quadwave to help the underprivileged, employees here are not just concerned with their jobs. They’ve learned to look beyond their desks and look at ways they can give back to the society. Quadwave works with several institutions nearby, enabling them to improve the quality of life of disabled children etc. Other factors such as encouragement for research and development and Geek Zone, are various ways in which employees at Quadwave can improve and become better versions of themselves. When people are financially invested, they want a return. When people are emotionally invested, they want to contribute.” – Simon Sinek. Every employee is family and Quadwave always believes in going that extra mile to see to its employee’s Happiness.